Here's a stat to chew on: roughly one in three Americans now own a smartphone, a computer and a tablet – a 140 percent increase over the last three years, according to Pew Research Center. Perhaps unsurprisingly, we love carrying those things everywhere, including our cars. 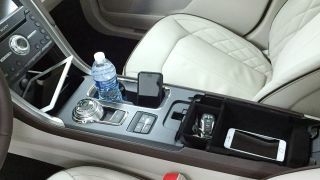 In fact, our society's obsession with gadgetry is triggering a fundamental change in the way Ford designs its interiors. Pew's researchers have found that among US adults today, 68 percent have a smartphone, up from 35 percent in 2011, while tablet computer ownership has edged up from 3 percent to 45 percent. Research also finds some 14 percent own a portable gaming device, while around 19 percent have e-book readers. To cope, the 2017 Ford Fusion has a staggering 59 percent increase in storage compared to the outgoing model. To provide a 4-liter increase to the main console storage area, the armrest has been lengthened about 3 inches, and a clamshell design has been incorporated for the upper compartment to make the space more accessible and user friendly. Kelly Whetstone, Ford vehicle architecture supervisor for Fusion, cited "customer feedback" as a primary reason for "honing in on the storage capability of the car." In other words, you now have more room to shove more things that are perpetually running out of battery. We sure hope you're happy.